This is something my Gran would say. Now I have kids of my own, I know what she means. It does worry me that we are in a digital world now and the ability to play outdoors is being lost for children. If the digital age doesn’t threaten outdoor play then the blame culture world we live in does. Children can’t do much these days as people are so afraid of being sued. Better safe than sorry eh? Well for me it isn’t better safe than sorry! Some of the best memories from my.childhood come from outdoor play. To this day I love nature and the great outdoors. If I hadn’t been allowed to explore and go out then who would I be today? I certainly wouldn’t be better and I may even be too boring enough to be sorry. There’s little need for toys if they are unavailable. Sticks can be used to make send or create arrows for a treasure trail: leaves can be used to identify different plants or for Autumn art: clouds can be watched for image games. I wouldn’t worry too much about it, just unleash your toddler and they will create their own fun. All you need to do is be interested in their ideas and nurture this creativity. Whether you go out with friends or not you may bump into other children playing outdoors, especially on the park. These times are great for teaching your children to interact with other children and share areas of play in a polite way. Getting some fresh air really will help with keeping our child healthy. 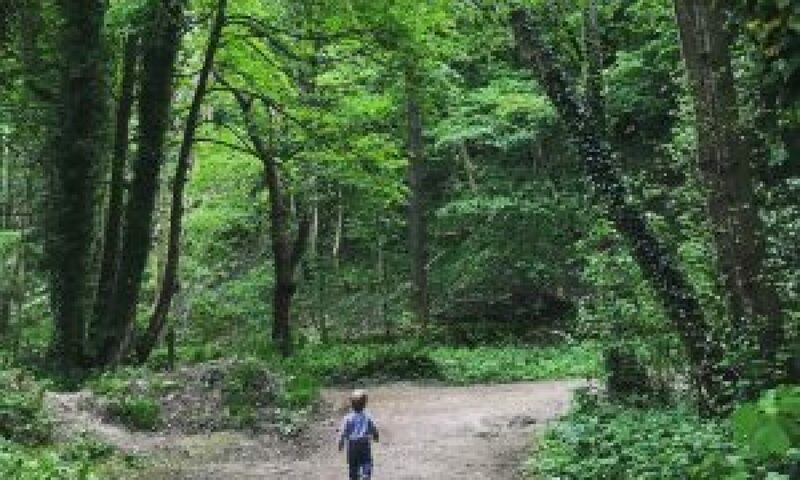 Being outdoors they will also be more likely to be getting exercise as they explore their world which is great for gross motor development and cardiovascular health. Children should always be protected from the sun using appropriate clothing and sunscreen but the sun can also help your children produce vitamin D. In the UK children are encouraged to take vitamin D supplements from birth which raises the question, why aren’t our children getting enough of this Vitamin, especially when they can make it themselves by just being outdoors. Take only photographs and leave only footsteps is a good motto for going into the wilderness. In the UK there aren’t actually too many dangers but in other countries, this may not be the case. Rather than avoiding the outdoors altogether, children will benefit from being shown how to enjoy the outdoors whilst being kept safe for a parent. Eventually, they will want to keep nature preserved and showing respect for wildlife will help little ones develop their empathy. Picnics are a cheap alternative to going out for a meal on a family day out. IF you get a nice spot they are also surrounded by play areas. This way your toddler isn’t confined to a high chair while you eat and will be free to play after they have had their lunch. Let’s not forget that your health as a parent/guardian is important too. We spend so much time looking out for our children it is easy to overlook our own health and wellbeing. Getting outdoors will be great exercise, and may also benefit your mental health. Use getting outdoors as an opportunity to visit the places you enjoy going whilst you have a choice. I live in the Derbyshire Dales and I have a few favourite walks. I am trying to find different circuits which are suitable for little ones. I might make a few posts about the best ones to do. LEt me know in the comments if you’d be interested in a read. I’ve been out on plenty of walks and came across parents on a hike with their children (approaching teenage years) who seem to think being on their phone or tablet would be better. No doubt when they are older they will look back on those walks and cherish the time they had spent with their family. As a teacher, I often come across children who do not get this important time and when they are given the opportunity through school they really appreciate it. My son does worry me as he will happily wander off without a care for how far he goes from Mum and Dad. Usually, when we go somewhere new he will venture a little and then when he realised we will follow him he will just gun it and try to go as far as he possibly can. Hopefully, he will develop a sense of danger soon, but until then I’ll be getting plenty of exercise. He is happy exploring on his own but sometimes wants to comfort of a parent playing with him or showing him a new trick with twigs or dandelion clocks. At the moment he loves colours so he likes to point as items and tell us the colour. He likes the attention and will try to find different items to identify so that he can receive praise. I read a post recently about a child that lived in a city and didn’t know what a cow looked like in real life. They could identify one in photographs but had no idea about the size of the animal. THe parent was really upset and took their child on a field trip to look at farm animals. I remember my father naming different birds as went out on walks as a child. He would describe the habitats of different birds as we approached them on our walks and tell us what to look for. When we saw a new bird or a bird of prey it was especially exciting. I’m looking forward to doing this with my own children. We didn’t just learn about the birds but where they lived and what they ate. I learned far more being out in the countryside than I would have done from books, maybe because I was learning whilst forming fond memories. Is this a myth or is there any substance to this claim? Well, I think there is definitely some substance. Even when my babies were too small to walk and they were confined to a pushchair as we went outdoors, I always find they sleep better after having a spell outdoors in the day. Whether it is because their bodies have to work harder to maintain their body temperatures with being outdoors in variable conditions or if it is something else entirely. You can rest assured, my kids will be getting plenty of outdoor time as they grow up. I expect plenty of grazed knees and bumps, but that is all part of growing up. Another lovely,informative post Adele . Keep up the good work. Very interesting read .